WASHINGTON ― PresidentDonald Trump’s sudden decisionnot to impose tough new sanctionsonRussialeft many lawmakers dumbfounded this week and led some to question whether Trump had seriously underminedNikki Haley, the U.S. ambassador to the United Nations, who had announced the sanctions just a day prior. 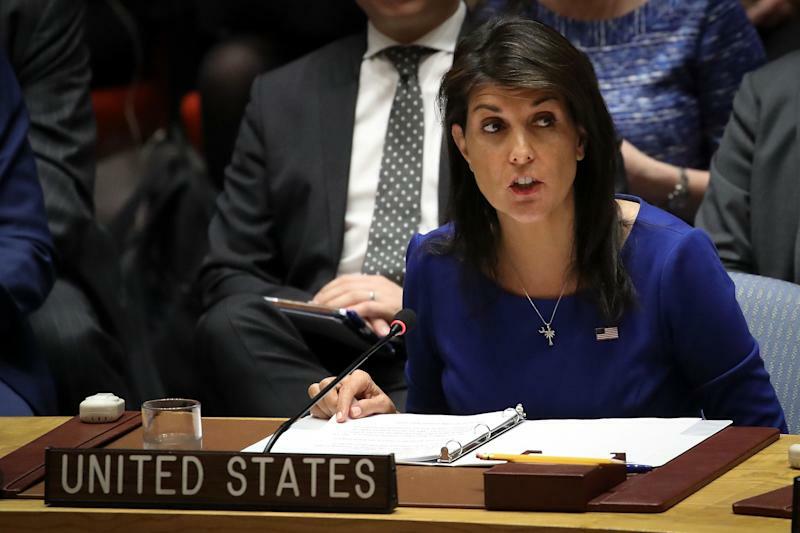 Haley made headlines during an interview on Sunday when she announced that the Trump administration would be rolling outnew sanctions against Russiaas punishment for its continued support of Syrian dictator Bashar Assad. Less than 24 hours later, however, after the Kremlin denounced the sanctions as “international economic raiding,” Trump decided to put them on hold “because he was not yet comfortable” with executing them, according toThe Washington Post. Haley’s comments, the paper further reported, had “caused consternation” in the White House on Sunday. “With all due respect,I don’t get confused,” Haley later responded in a statement of her own. “You know, two weeks ago we were moving out of Syria, and then the next day we weren’t, so it’s just sort ofstandard confusion,” he told reporters. CORRECTION:An earlier version of this story said Russia had annexed Ukraine. Russia annexed Crimea, which is a part of Ukraine.